About half of Security Cabinet ministers reportedly reject PM's push for cease-fire, preventing vote on motion. The Prime Minister's Office attempted to portray the Political-Security Cabinet as unanimous in its decision on the reported ceasefire with the Hamas terrorist organization. Sources close to the Cabinet debate say that Prime Minister Netanyahu came to the meeting, determined to have the Cabinet approve a cease-fire. The security officials expressed their opinion to the ministers that efforts to bring calm to the Gaza border should be exhausted at this stage. After the security officials presented their position, a discussion was held in which each minister expressed his opinion. Ministers Naftali Bennett and Avigdor Liberman presented a firm stance against the cease-fire and offered alternative plans. Ministers Ze'ev Elkin and Ayelet Shaked also joined this opposition to the cease-fire. 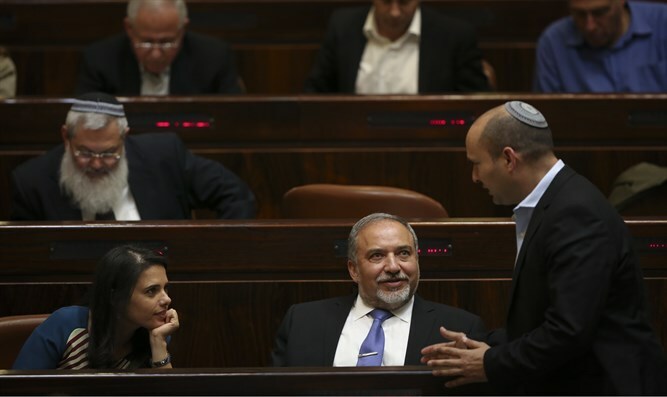 The sources said that the prime minister feared that if he decided to vote, after the debate it would turn out that at least four ministers had voted against it, one of them from his Likud party. In addition, there was concern, although the other ministers expressed some level of support for the cease-fire, one of them would change his mind and the motion would be rejected. During the discussion, one of the ministers suggested continuing the ban on cabinet ministers because no clear decision was reached, but the prime minister led the line that it would be preferable for the ministers to explain why the cabinet supports a cease-fire. Most of the ministers, who apparently were not at peace with the decision, are still keeping silent. The only minister interviewed was Netanyahu's close associate, Yuval Steinitz, who presented a position supporting a cease-fire and even stated that the entire cabinet stood behind that decision. About 460 rockets and mortars have been fired at Israel by terrorists in the Gaza Strip since Monday afternoon.